This is a book I would have liked to have had when our offspring were youngsters! Its 66 pages are interesting and easily read in about forty minutes, but it is not hard to spend a lot more time with this book because of the many fine illustrations and photos that take up about half of its pages. That sums up the book very nicely. 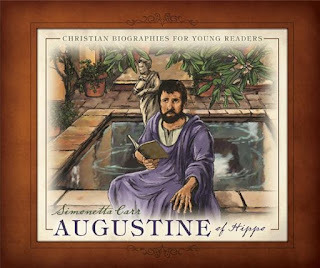 Along the way, we learn about Augustine’s Confessions and his twenty-volume The City of God, all of which are still readily available today. We get a clear understanding of why the teachings of Pelagius were false. We discover many more interesting facts about the culture and history of the Roman Empire. This is a very readable book for the ages 7-12, but can also serve as an excellent resource for parents and teachers. Recommended without reservations.